Trying to eat healthy while you’re constantly on the go isn’t easy because prepping a healthy meal takes time and picking up a healthy meal that is already prepared, is much more expensive than the alternative of rolling through an unhealthy drive-thru. I used to be so good about making a smoothie every day and replacing a meal with it. I loved how energized and full I felt! I didn’t feel disgustingly bloated like I would if I stuffed my face with fries and chicken nuggets. So in light of trying to get back on a routine and living a healthier life, I’m starting back on my smoothies! I’ll be honest, I winged this one. I threw together some of my favorite things and just went for it. Hey, it worked! Since I’m sure most of you are in the same boat as me, busy and losing your mind from time to time, I figured I would share something that fills me up and takes the place of fast food. Feel free to take away or add anything that you like to your smoothies, but this has been my go to lately! I purchased all of my products from Kroger. I did not choose organic products simply because I wanted to save money but that is definitely an option for those who would like to step their smoothie game up! I chose not to add ice cubes to this one because I was playing around with consistency but if you like your smoothie really cold, throw some in there! You can also add honey to give it some sweetness if you’re really hesistant about this whole green drink trend that is going on. 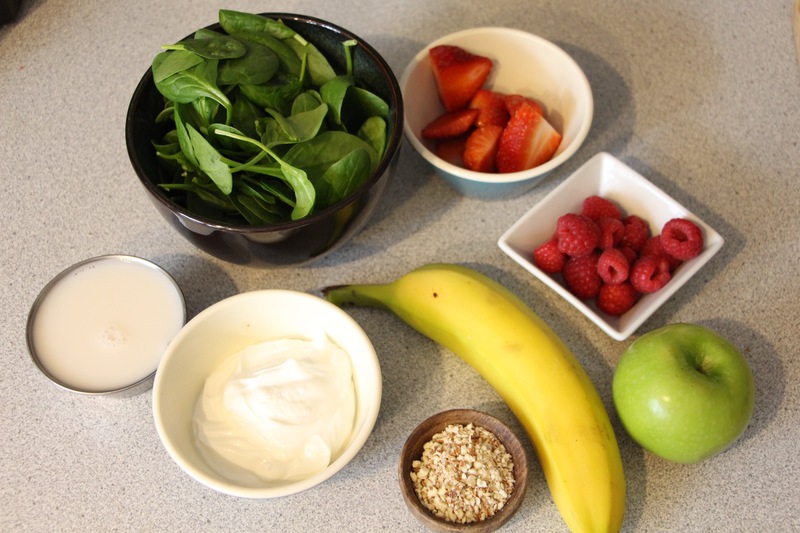 What’s your favorite smoothie recipe? Do you have tips and tricks for on-the-go meals when trying to stay healthy? Comment below!